Two weeks ago we brought you the story about Czech international Tomas Kalas. The 18-cap international defender featured for the visitors at Wembley this international break, and the Chelsea defender's loan club CEO has confirmed his loan deal at Bristol on loan from Stamford Bridge has no option to buy and his future is extremely uncertain, with Rangers and Celtic looming. "I said before that we have an option on Dasilva. We don’t have that on Kalas. It wasn’t part of the availability. He’s done so well for us. We have ongoing discussions with Chelsea and he will come into the discussions." 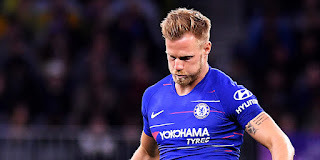 And the player has previously said he’s happy to continue to go out on loans, but with his deal at the Bridge continuing for another two years unless someone puts in the big millions to secure this defender’s services, he’s going to remain a loan Bridger for the time being. After the general division caused by Joe Worrall’s loan status, we’re not sure it’s a road Stevie should go down – rather make it a permanent addition. Kalas is rated around £4M for a weak Czech national team. But the sad likelihood is the big Czech CB will just remain in Bristol. Any ex Chelsea man that signs for that lot, is a total disgrace.